Horizontal cut better than a vertical one on the forehead, should heal up well. 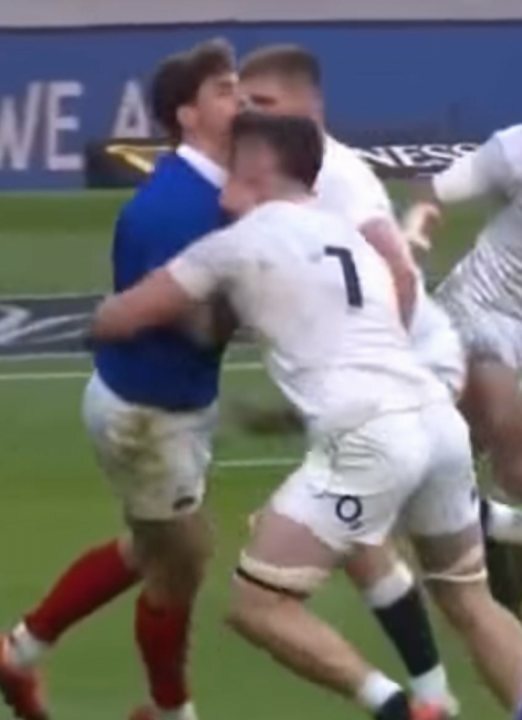 It came shortly after a nasty upright tackle, where the French carrier raised his forearm/elbow into Curry's face. I suspect we may see a few more replays/gifs over the coming days, and perhaps a note from the citing officer. Thought it might have been face-to-face? Looked like a hand-off to the jaw then an accidental clash of heads. Think that's pretty normal for hockey though right ? Thought it was chin to forehead. There was no foul play involved that I could see. Was that during the same phase? Am surprised the ref didn't tell him to get fixed up. No probs. with an imperceptibly furrowed brow. If he could get a couple more scars and possibly a Mike Tindall style nose break, we'll finally be able to tell him and his brother apart. How do you know it wasn't his brother who came back on with some bandaging taped on as a cover up? No. He definitely handed him off on the chin from the replay I saw. Curry's head then came forward and hit something... Even if it was elbow it was accidental by then. Absolutely. I'm not claiming malice by any stretch, but the Laws don't require malice for it to be dangerous. Whether it's a YC or a citing/RC is debatable. There was clear malice in the hand off but if you're going to start calling a hand off a 'strike to the head' , then what? 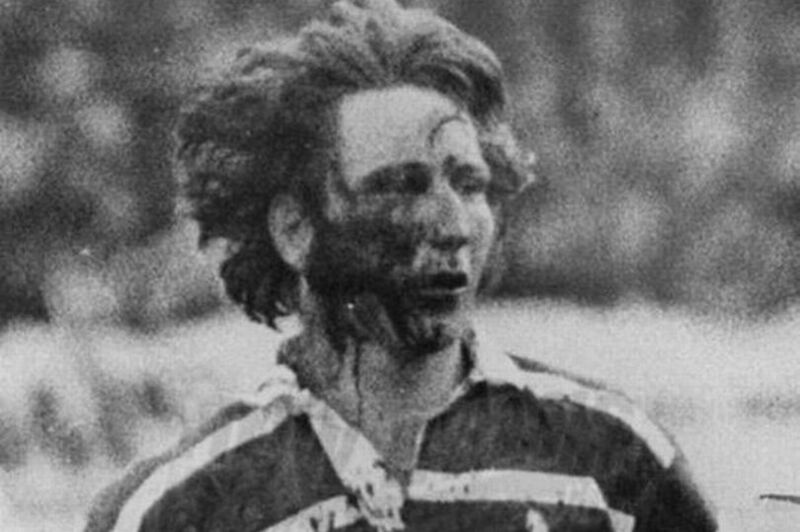 The Laws only talk about excessive force (although they clearly describe a "Hand off" using "The palm of the hand"), but there was a referee's directive at the start of the year to look more closely at the fend when there is head/face contact. Eddie's got him hanging around just in case, in a fedora, sunglasses and trench coat. I have posted it, but am very pleased to say he was educated in my lovely Town. 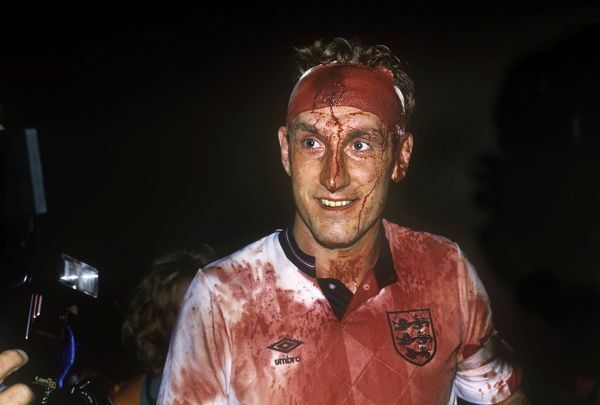 Was it Terry Butcher, a former England football captain, who played on with a similar injury? 30-odd stitches from a cowardly kiwi boot. Do you know if the kiwi's other boot was less cowardly? Yeah but his Mum's a Sandbach lass. Surprised that blood wasn't green. Stunning that a chin could create such a massive gash without cutting itself. Not really. I've put a sizeable gash in someone's forehead while my gently dimpled chin remained unscathed. Appropriately enough, I've just lol'd at the memory of Dallaglio's Diaries (circa 2007???!!) and his suggestions for an English Haka-style routine: "Looking chinward". We've had a few great diaries. Was it Danie Rossouw that Muppet did some years ago? Christ that was funny enough to rival Dallaglio's. Warburton's was pretty damn good too.